I never decorate for Thanksgiving. I typically use the time between Halloween and Christmas to mentally prepare myself for the madness that is decorating for Christmas. But I whipped up a small Thanksgiving project for the ‘be thankful’ portion of the Dare to DIY series I’m co-hosting with Kim, Michelle, and Rachel. And I knew the perfect place for my creation– on the card catalog, of course. Honestly, I wanted the bunting to say ‘give turkey’ but I figured ‘give thanks’ was a more practical approach. This project was pretty easy to execute and took about an hour to make. I used leftover burlap from my ruffled burlap table runner project and a bunting template, which I edited because I have perfection issues, for the the bunting flags. The letters were stenciled on with acrylic paint . The stencils were created with my Silhouette (speaking of Silhouettes, have you entered the Silhouette giveaway?). And I hot glued the flags to grosgrain ribbon. I had all the materials on hand so I spent a whopping $0 to create this festive burlap bunting. I think it looks pretty good tied onto the card catalog. But then again I think you could tie underwear to the card catalog and it would still look good. It’s like Channing Tatum. That man would look smokin’ in a potato sack. Or underwear. Or burlap bunting. Jack even agrees that the bunting looks great on the card catalog. And he’s picky about his endorsements. So will you Dare to DIY on Monday? Read all the details here. 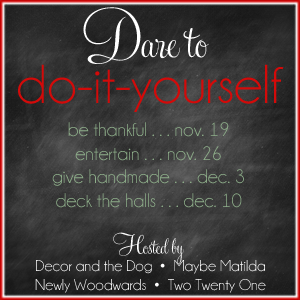 Are you participating in the Dare to DIY series? 5,000 bonus points awarded to the person who integrates Channing Tatum into their creation. I’m also sharing this at the following parties: Home Stories A to Z, Tatertots and Jello, House of Hepworths, The Shabby Creek Cottage, Tidy Mom, Liz Marie Blog, Craftomaniac, The Shabby Nest, Positively Splendid, Whipperberry, Funky Junk Interiors, Classy Clutter, Today’s Creative Blog, Uncommon Designs, Live Laugh Rowe, Miss Mustard Seed, and Serenity Now. Well done! I just love the versatility of burlap. And look at your puppy posing 🙂 So dang cute. Jack approved. And Channing Tatum approved, apparantly. Looks great! And I love a good thrifty project! So cute! I love it! These little burlap banners are fabulous! I’m a fan as long as Jack approves. Darn you and your daylight photos. Hot gluing instead of sewing: totally the right call. Looks great! I was wondering where you got your chevron pillow. It is so cute! Thanks, Katelyn! I scored the pillow and its twin back in March at my home away from home, Home Goods. I would totally keep it! I’m dying to get one. I love it! 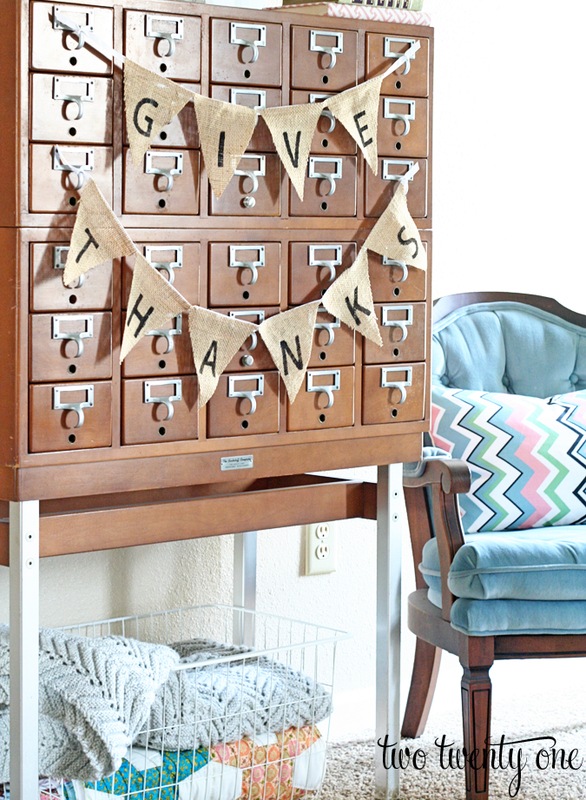 You are right about the card catalog that thing is sweet, but the bunting is the perfect Thanksgiving decor for it! This came out so great! I love the bunting and your photos are beautiful. Also, I am swooning over your card catalog! So pretty! I love how it feels a little rustic, but polished at the same time. Great project! The bunting turned out great, and your little doggie model is precious! pretty! i’m new to your blog and i just love the whole look of that room – dog included!! I totally agree with you about not decorating for Thanksgiving. I barely got around to Halloween this year because I am so excited about living in a house this year during Christmas that I have been planning since mid-October. I blame Pinterest. Thanks for this great challenge can’t wait to see what everyone does next week. 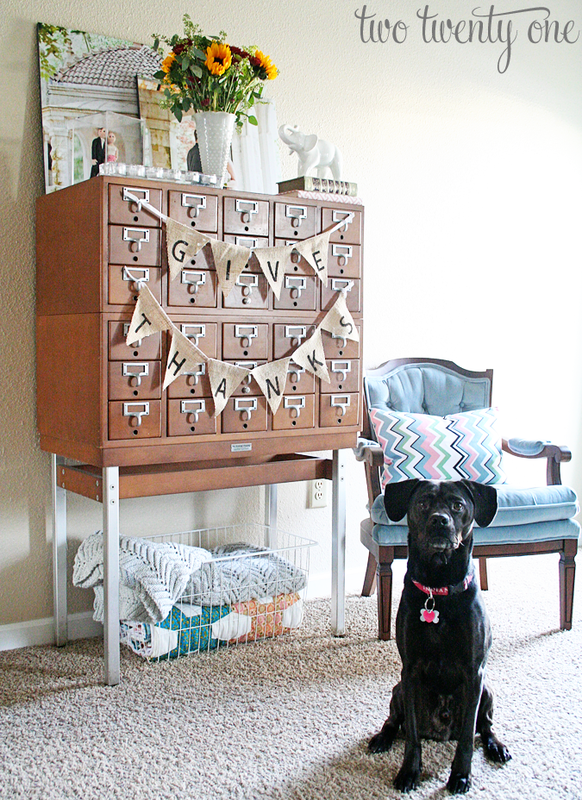 I’m not sure what I love more–the card catalog or your project! Thanks for co-hosting the Dare to DIY par-tay! Love the burlap! I’ve had a hankering to play with burlap since seeing it at a tabletop event last week. I think it will be making an appearance soon in a Christmas tablescape. Thanks for the fun link party! 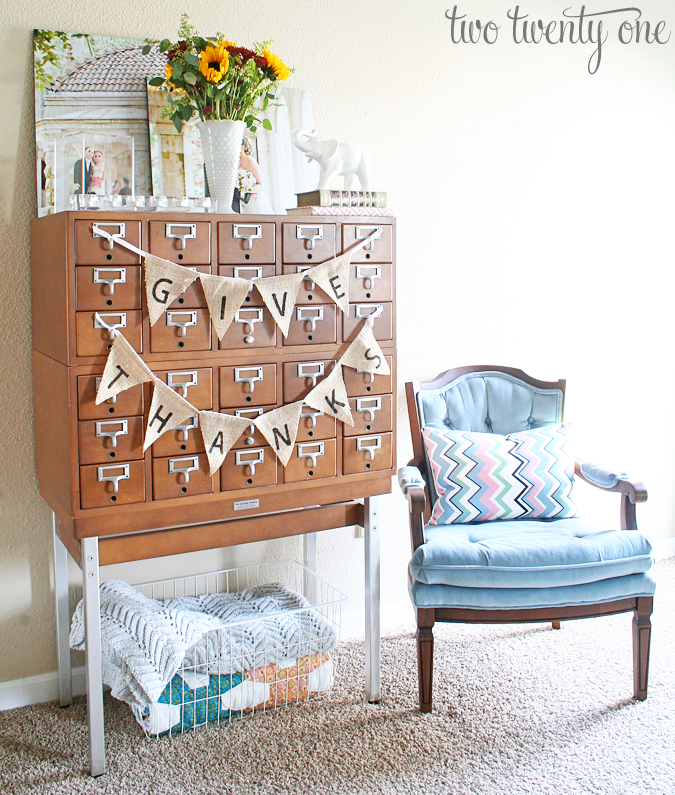 Love, love, love that card catalogue! Your banner looks quite at home there! Great job!